This article is about the bridge illustration, which can be shown to people interested in hearing the Good News, or the Gospel of Jesus Christ. Normally the 4 pictures are shown in a very simple stick man style. These 4 pictures tell the essence of the Good News & can literally be drawn on a napkin. 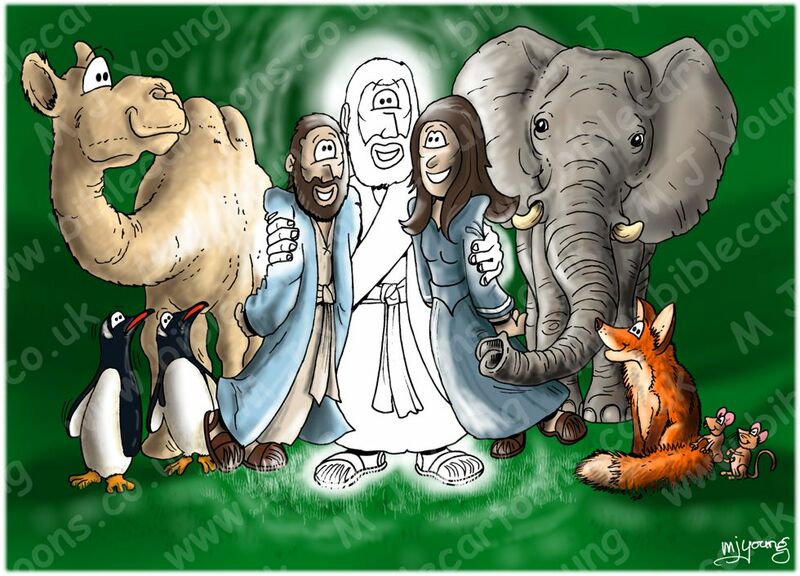 I have drawn more elaborate versions, but the message is the same: God loves all mankind; Sin separates us all from Him; Jesus came to earth to die in our place & that act opens the way for us to cross over from sin to eternal life; now we just have to believe & we will be saved. 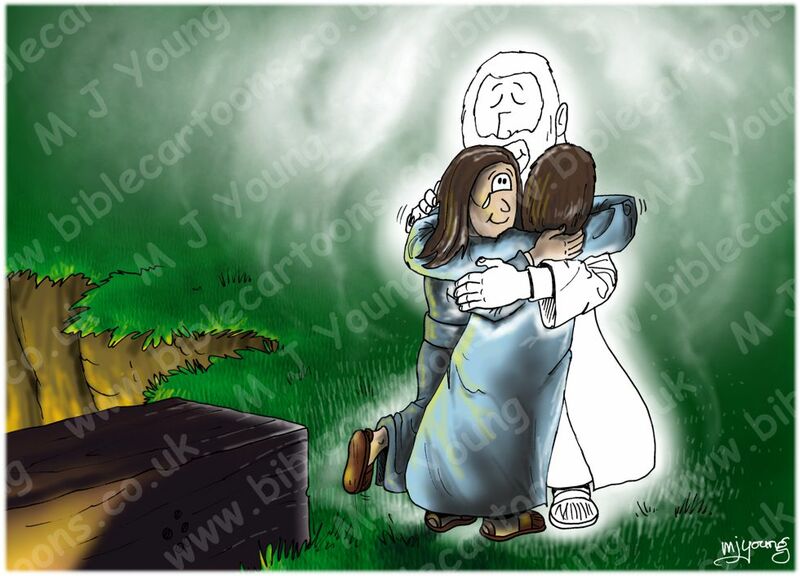 Click here to see this scene in Gospel Illustrations, with notes & purchase options. Illustration 1 shows the world as God originally created it, with man & woman in close relationship both with each other, & with God Himself. We were given freedom of choice, so that we were truly free to love God, or not. Only in this way could we (& God!) be sure that our decision to love God, or to love at all, was truly our own. Free will, or choice is the greatest gift God has ever given us. Illustration 2 shows the effect of Adam & Eve’s wrong choice. In choosing to disobey God & eat the fruit of the Tree of Knowledge. they sinned: sin entered the world. The effect of that was cut man & woman off spiritually from God. 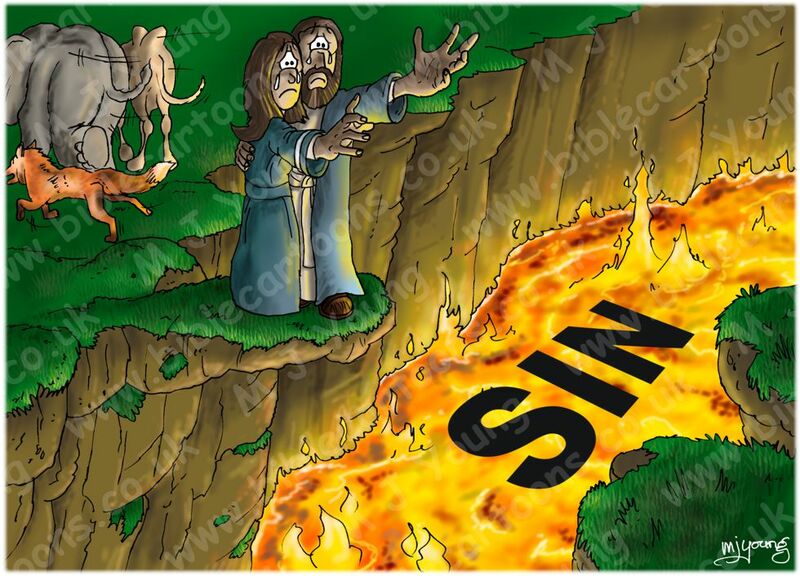 Hence I have drawn the deep lava-filled chasm, with the word “Sin” in it. The chasm is so wide that mankind can never get across to the other side, where God is. 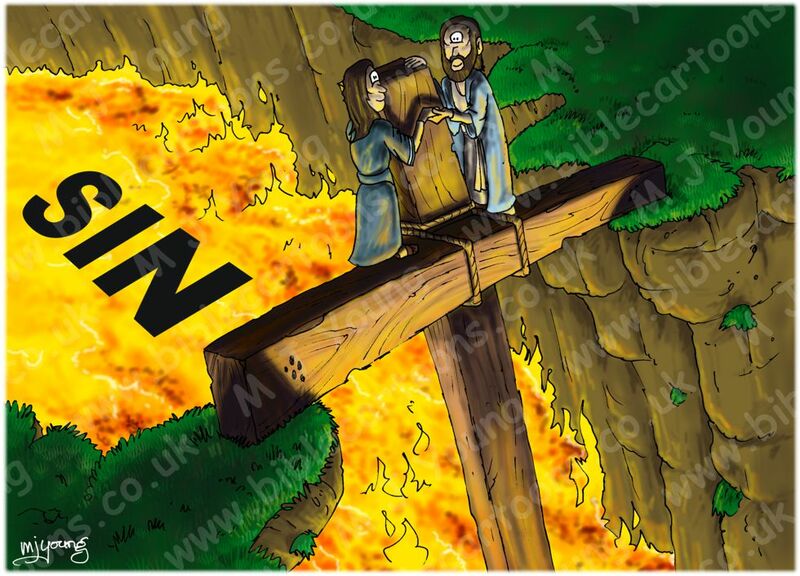 Illustration 3 shows the cross of Jesus, providing a bridge across the lava/sin chasm, & you can see the man & woman climbing across. This is a literal picture of what Jesus life, death & resurrection achieved for us: a bridge that spans the sin of our world; the sin which separates us from God. No amount of working, or striving, of trying to be good, can bridge the gulf between us (fallen mankind) & God. We simply can not cross from our side of the chasm to God’s side. The Good News is that Jesus Christ took all of our sin upon himself, as he hung on the cross. By accepting Jesus Christ as your personal saviour, you are effectively nailing your own sin to Christ’s cross. And His righteousness (or right standing before God) is transferred to you. When you accept Jesus as your personal saviour, you too are able to cross the sin chasm & gain access to God once more. You become like Adam & Eve before the fall. If you want to read more about this subject, just click on “Statement of Beliefs” under the “Information” button above, where The Roman Road (another illustration of the Gospel) is explained.